The power of a Phase Fresnel lens in a revolutionary 300mm. Introducing a thrilling new 300mm f/4 prime lens capable of changing the way pro and serious enthusiasts shoot. At just 147.5mm long and 755g—over 30% shorter and 1.5lbs lighter than its predecessor—the AF-S NIKKOR 300mm f/4E PF ED VR is the world's lightest 300mm full-frame AF lens. (As of January 5, 2015. Statement based on Nikon research.) The secret to its remarkable size? A Nikon-designed Phase Fresnel (PF) lens element, a first for the NIKKOR DSLR lens lineup. But handling isn't the only advantage; the PF element also performs brilliantly—achieve new levels of sharpness and clarity with virtually no chromatic aberration or ghosting. Whether you shoot fashion, portraits, nature, wildlife, sports, action or today's big stories, the AF-S NIKKOR 300mm f/4E PF ED VR will help you capture stunning views of the decisive moment. The AF-S NIKKOR 300mm f/4E PF ED VR is a cutting-edge lens engineered to draw peak performance from high-resolution full-frame cameras. The Phase Fresnel element nearly eliminates chromatic aberration on its own. When combined with an Extra-low Dispersion (ED) glass element and Nano Crystal Coat (N), it delivers strikingly clear, accurate images. Nikon's Silent Wave Motor (SWM) provides ultra-quiet, ultra-fast autofocusing with seamless manual override (just spin the focusing ring), and a Fluorine coating on the front lens element effectively repels dust, water, grease or dirt, ensuring easy cleaning. The AF-S NIKKOR 300mm f/4E PF ED VR is a quintessential prime lens that belongs in the serious photographer's bag. Its fast f/4 maximum aperture and rounded nine-blade diaphragm produce beautiful bokeh. A highly accurate electromagnetic diaphragm mechanism ensures consistent exposures, especially when shooting at high frame rates. And for greater reach, the AF-S NIKKOR 300mm f/4E PF ED VR is compatible with most Nikon Teleconverters. Work in nearly any light, at any distance, with outstanding sharpness and contrast. 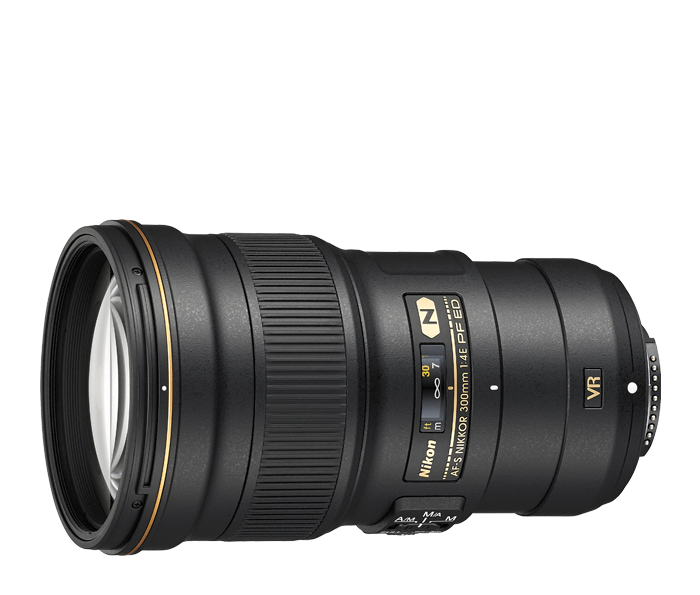 The AF-S NIKKOR 300mm f/4E PF ED VR's Vibration Reduction (VR) feature provides an image stabilizing effect equivalent to a shutter speed increase of 4.5 stops* (in NORMAL mode; based on CIPA Standard). Capture sharp, clear handheld images in low light, of fast action and more. VR modes specifically designed for Sports & Action and Tripod Shooting deliver specialized image stabilization to match your situation. Phase Fresnel (PF) lens elements effectively compensate for chromatic aberration and ghosting when combined with ordinary glass lens elements. The PF lens element is based upon the Phase Fresnel lens, which appears to have a series of concentric circles engraved onto it. Utilizing a Phase Fresnel lens element allows Nikon engineers to use fewer lens elements, resulting in a more compact and lightweight lens. Due to the characteristics of a PF (Phase Fresnel) lens that utilizes thephoto diffraction phenomenon, when there is a strong light source withinthe frame or when light enters the lens from outside of the frame,ring-shaped colored flare may occur according to shooting conditions. Thisphenomenon can be minimized with “PF Flare Control” to be included inCapture NX-D (ver.1.1.0 or later). For more information, see softwareHelp/manual. Capture NX-D is available from the Nikon website. Be sure to keep your software up to date.